Broadbent's Kentucky Ham for sale. Buy online at Zingerman's Mail Order. Gourmet Gifts. Food Gifts. Whole smoked and cured American country ham. 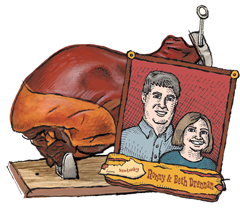 This whole, bone-in ham is smoked and cured by Ronnie and Beth Drennan in the town of Cadiz (pronounced “Katy's”), down in the southwestern corner of the Bluegrass state. The ham is rubbed with salt and a little secret spice, then hung to cure at a steady temperature for about nine months. It's not quick cured at higher temperatures nor relegated to a cool room to keep its weight, two typical cost saving measures. The resulting ham is sweet and tender with an honest pork flavor. It’s served that way at David Chang’s Momofuku Ssam Bar in New York. You can do the same at home. It makes a spectacular centerpiece for a party buffet table. If you’d like to make slicing easier, we offer a Spanish ham stand (illustrated with ham). Shipped without ice. It's been cured at ambient temperatures through Kentucky summers, so it's built to last. Lasts for months when stored in a cool spot. Storage instructions included. It’s also worth keeping in mind that Ronnie and Beth make amazing sausage.